This blog has been adapted from an oral presentation. Welcoming children makes us better Christians. Matthew 19:13 – 14 states “Then little children were being brought to him in order that he might lay his hands on them and pray. The disciples spoke sternly to those who brought them; but Jesus said, “Let the little children come to me, and do not stop them; for it is to such as these that the kingdom of heaven belongs.” Following Jesus’ command to welcome children allows us to see the image of God, and what the kingdom of heaven may look like, in a different light. Welcoming children teaches them the rhythms of worship. When children worship with parents, grandparents, and other congregation members, they pay attention. When adults model the faith in any context, children pick up on it. I understand this doesn’t happen every week, but when a young child climbs over her friends and the pew to share a hymnal with me, I will celebrate that moment as a major faith formation “win”. If children aren’t in worship, when, how, and where else are they going to pick up on these traditions? Welcoming children benefit both kids and adults and forms everyone’s faith. By it’s very nature, it’s cross-generational. At Good Shepherd, we do some intentional things to communicate to young people that they are, in fact, welcome. Here are a few examples. As families enter the Narthex, to their left, child-sized portions of kid friendly treats are available at the coffee bar. Parents of small children are encouraged to take some with them into worship to have on hand in case their child gets hungry midway through. At the entrance of the sanctuary stands our beautiful worship bag stand created by Johanna and Frank Taylor. If you see a young child (ages 3 – 8) entering worship without a worship bag, assume they are unaware of their existence and draw their attention to the bags. They are full of Bible stories, activity books and other items perfect those who find it difficult to sit still for an hour straight (i.e. most kids and many adults). 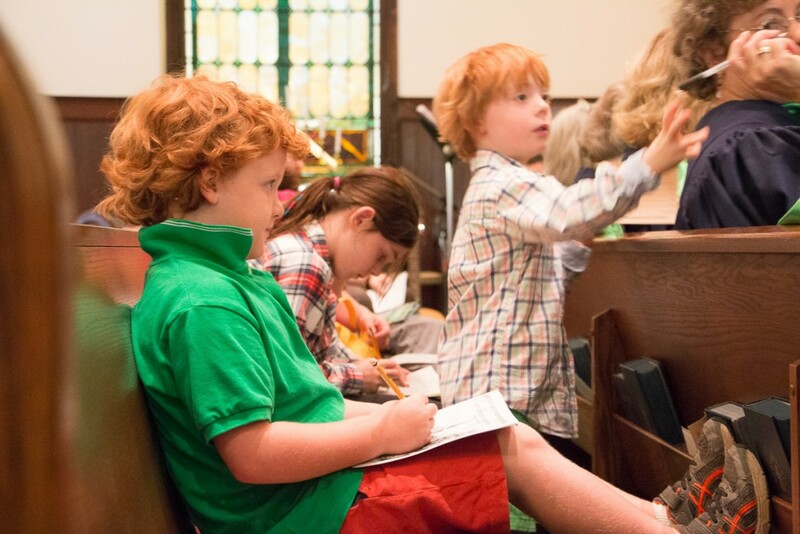 When children enter the sanctuary, they are welcome in any pew. Yes, even yours, though families tend to gravitate toward the side aisles due to their easy access to the cry room or nursery. Some families like to sit up front so the kids have a better view of what’s going on, for instance, when Baptisms occur. For those sitting further back, walking up to the font or standing on the pew to sneak a peek are both perfectly acceptable. Children’s Bibles are available in many of the pews including each front row, the last four rows on the organ side, and the first four rows in the baptismal side. There are also some available by request at the sanctuary entrance in the little usher side tables. When parents open up their bulletin, they will read that children are welcome. Through written communication we share how excited we are to have them and their children in worship, while also letting them know about the amenities available, including the cry room and the nursery, if needed. Finally, communion is available to all children who desire/reach for it. Children not receiving communion receive a simple blessing. If you meet a new family on Sunday morning, please let them know not only what we offer for children but that they are welcome, and needed, at Good Shepherd!